My favorite way of preparing eggs is to fry them over medium. But sometimes, I like to switch it up a bit and boiling them in their shell until soft is my favorite way to do that. It's faster than boiling them hard, and (since I don't much like solid yolks) it's tastier. Here's how I do it. This recipe assumes the eggs have been refrigerated and have just been removed from the refrigerator before beginning. 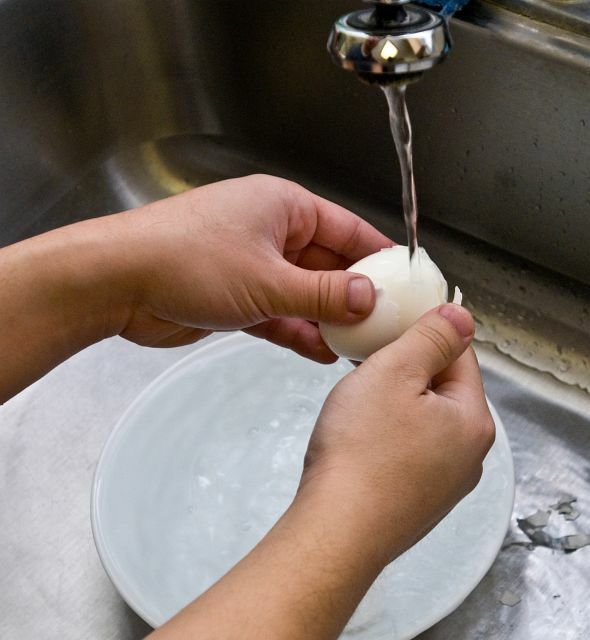 Boiling eggs in the shell pretty much starts the same way - by bringing water to a boil. The amount of water is variable depending on the size of pot and the number of eggs being boiled. An easy way to determine how much water is needed is by placing the eggs into the pot selected and pouring water in until there is at least 1 inch (more than 2 cm) of water covering the eggs. You really need only about 1/2-in. (more than a cm) of water above the eggs for this to work well, but I find that some amount of water will escape as vapor while it is boiling and waiting for eggs to be deposited. 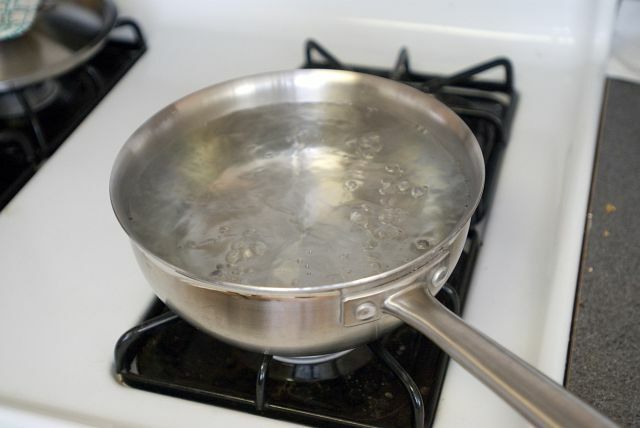 Depending on how often you check on the pot, water loss can be substantial, so try to make sure you have at least an inch of water over the eggs before you start. Remove the eggs from the water and place the pot (with its lid on) onto the burner on medium-high to bring to a boil. The water is ready once it reaches a rolling boil (large bubbles rising cause the surface of the water to tumble and roll). 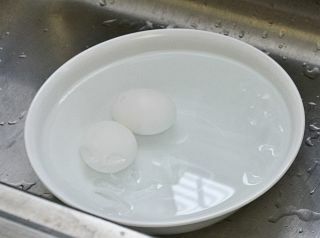 Once the water is boiling, place refrigerated large eggs into the boiling water, cover, and remove the pot from the heat. Allow the eggs to steep in the nearly boiling water for seven minutes. As soon as seven minutes are up, remove the eggs and place into an ice water bath. This will chill the exterior of the egg serving two purposes. When rapidly cooked, eggs, like most dense foods, do not heat evenly. The outside portions of the egg (the egg whites) are much hotter than the interior (the egg yolk). By shocking the shell with ice water, we lower the temperature of the egg whites to a temperature below that of the egg yolk and this causes the egg yolk to stop cooking. 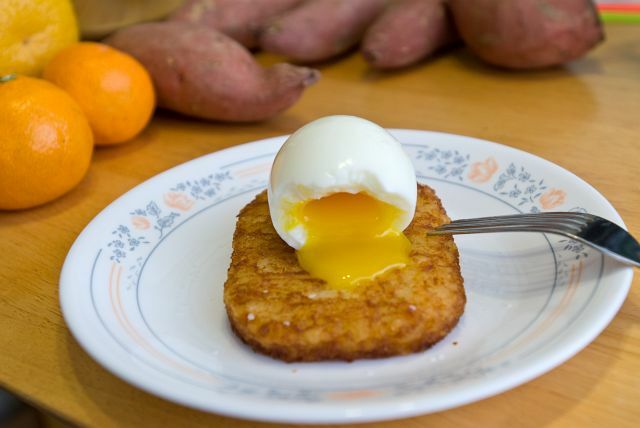 Otherwise, the yolk would continue to draw heat from the whites and raise its temperature while the egg white temperature lowered resulting in overcooked egg yolks. The other reason for shocking the eggs is that it causes a little bit of shrinkage in the egg, hopefully making it easier to peel. After about 1 minute, peel the eggs. I find it easiest to do this by tapping the egg lightly (just enough to crack the shell) all over starting with the fat end (I start here because there's an air pocket and I feel more comfortable using a little more force to break the shell without damaging the egg). I then run a thin stream of cold water to help pull away the shell and membrane as I carefully peel the egg. Be careful, it's not as hardy as a hard boiled egg due to the liquid core. If the soft boiled eggs are too cold after you're done peeling them, you can submerge then into the cooking liquid (which should be just around simmering at this point in time) to reheat. About two to three minutes will bring it back up to temperature. If this is your first time using this recipe, I suggest cooking one or two eggs with this method first. Breaking into the egg, you should find the whites almost fully cooked (solid) with the yellow yolk thickened and viscous. Note: For individuals with a poor immune system, the young, or the elderly, it is not advisable to consume soft boiled eggs or undercooked yolks. That's interesting, my cooking method for soft boiled eggs is, after adding eggs to boiling water: boil for 1 minute, take off the heat and cover pan for 4 minutes. The rest of the "recipe" is the same, except I usually serve them in the shell in an egg cup, not peeled. I would have thought that 5 minutes at a boil would mean they were overcooked. Might have to try it some time for comparison! An easy way to determine how much water is needed is by placing the eggs into the pot selected and pouring water in until there is at least 1 inch (more than 2 cm) of water covering the eggs. . . Remove the eggs from the water and place the pot (with its lid on) onto the burner on medium-high to bring to a boil. Are you kidding me? Such a waste of effort, just guess about the water height, but most importantly you DO NOT need at least an inch of water above the eggs. I just made some perfect hard boiled eggs tonight with water that didn't even quite cover the eggs. I make soft-boiled eggs all the time the same way. The only reason I can think of for putting a lot of water, is the same reason you want a lot of water when boiling pasta: so that the water doesn't cool down a lot when you add the room temperature/fridge temperature eggs/pasta to the water. But if you're doing one egg, having extra water in the pot won't make a huge difference. Secondly, if you have less water, even though the water may cool down a bit, it will heat up fast anyways when you are doing the keep-the-pot-on-the-element method. I am also a bit surprised that they the yolks are not solid after 5 minutes. I usually go for 4 and any longer makes the yolks solid. Probably depends on the size of the eggs. Are you using small eggs? I love a nice soft-boiled egg, but usually end up scrambling instead because I can never seem to get the boiling right. I guess the ice bath is the key! Thanks much. I'll try this tomorrow. First of all, nice to have you back, Michael, it's been awhile since I've seen a post from you and I've missed it! This is kind of straying from topic, but I tried making tea eggs recently and I really like them. These eggs are hard boiled all the way, then the shell is cracked but not peeled. Then you steep the eggs in tea in the fridge for a day or too. If you do it right, the egg gets a pretty cracked shell pattern, and the tea gives the egg a nice complimentary flavor. Most of the ones I have made I cracked the shell too finely, and the tea seeped in and just colored the entire egg. Still tasted good, but not something I would serve at a party. I think the secret it to tap the egg with a butter knife instead of rolling it, and using really strong tea to steep in. Four eggs into the pot, three cracked within 10 seconds. Anyone have an alternative method? I'm retesting the cooking method with a couple different pots as we speak. I'll probably update the recipe with a non-boiling recipe once I'm done with my tests. Stay tuned. I finished running another set of soft boiled egg tests and updated the article to use the boil water and remove from heat method which should result in fewer cracked egg shells. The recipe produces a soft boiled egg that is peelable and has solid whites with a viscous and flowing yolk. I'll be posting an article soon with the various stages of soft boiled eggs for those who want looser whites or a more solid yolk. a very old trick to minimize cracking is to pierce the big end of the egg. that lets the air sack expand and minimizes internal pressure. there are purpose made "egg piercers" - I have used an ice pick in a pinch. I use a hot pot for this. I put the egg in with the water tepid, and usually let it sit for a while to warm up a bit. Then I plug in the pot and let it come up to just starting to boil, unplug and cover it, and let it sit for four minutes. I quench the egg under cold tap water and shell immediately. Since I generally scoop out the egg into a bowl, continued cooking of the yolk is not an issue. I use a needle and make a small hole in the big end. The eggs never ctack. Gday from a fellow Engineer in NZ. Just made the boiled eggs and my wife declared them the best she had ever had. The idea of peeling them is amazing - great stuff! i agree with an above comment. if cooking just 2-3 eggs, i don't really bother covering the eggs completely with water. Mine usually goes up to only half or a little over half the eggs. bring water to a boil, turn off heat, put in eggs and cover. i usually take out mine after 6 minutes, if the eggs came from the fridge. i love them a little runnier. 10 minutes to hard-cook it. if your concern about cracked eggs are on the whites running out, i would suggest adding a tablespoon of white vinegar in the boiling water. that should keep the whites in. or if it's the cracks that bother you, i usually wait about 30 seconds to 1 minute before i put in cold eggs. that had so far kept mine from cracking, and still cooks the eggs to my satisfaction. by the way, i take the eggs out of the fridge before i even start filling the pot with water to boil. I tried this Technique twice and failed both times. In the end the last bit of peel sticks still to the Egg and hinders complete peeling without breaking the Egg. At which point could I have messed up. ....At which point could I have messed up. Another tip is to use a slotted spoon to deposit each egg into the just boiled water - that prevents them from possibly cracking as you "drop" them in. I agree, you HAVE to use a spoon to lower them into the water. Otherwise you will definitely get cracked eggs, especially if the water height is 1 inch above the eggs! Otherwise you will definitely get cracked eggs, especially if the water height is 1 inch above the eggs! Ah, here freshness of the eggs makes a difference. Older eggs are less likely to crack when you have ample water because they float (due to the air pocket in the big end) and won't smack into the bottom of the pan. The recipe as tested didn't work for me, but a slight adaptation worked best. Follow all instructions up to removing the pan from the heat. Turn off the burner, but leave the pan on the heat for 5 minutes. Remove eggs, shock in cold water, enjoy . Maybe the make of my pan lets the water cool more quickly or some other reason. Whatever the reason, this slight modification worked perfectly for me. I've never managed to make soft boiled eggs that perfectly. Also, for peeling, I gently tap with the dull side of a table knife to crack all over, then gently peel. If the shell is a problem, there is an easy solution, get rid of it before cooking. 5. Boil the egg 5 to 7 min. 6. Without pinching the egg, cut the thread and remove the egg from the plastic, sometimes it sticks, so be careful. It's a hash brown patty (from Trade Joe's). Wouldn't you have to figure in the elevation at which the eggs are being cooked to determine the amount of time to cook them? For hard-boiled eggs, quenching them immediately helps prevent the yolk from getting a greenish tinge on their surface (resulting from a reaction between sulfur from the white and iron in the yolk). You can add cream of tarter to the water before boiling and it will make the new (fresh) eggs easier to peel. Subject: Altitude? ..for cooking eggs? Subject: Re: Altitude? ..for cooking eggs? Altitude affects cooking because air pressure is reduced at high altitudes. With a reduction of air pressure comes a lowering of the boiling point of water which will reduce the maximum temperature that water in an unsealed container can be brought to (and thus how much a food cooks in a given amount of time). The difference between ten to twenty feet (an indeed a few hundred feet) will not make much of a difference. However, being 5,000 ft above sea level will affect your ability to replicate a recipe that was developed for use at or near sea level. First, it's really a bad idea to put the eggs straight from the fridge in the boiling water. Most "commercial" eggs will crack. Drilling a small hole in the shell may do the trick, though. Second, the optimum time period to get a runny yolk (just a pinch thickened is best) and a solid while is very narrow. The most forgiving method is the one in which one brings the eggs to a boil, then immediately turns off the heat and waits a certain time. Third, whatever the method, the timing depends on so many factors (heat level and type, water quantity, egg count, egg size, atmospheric pressure) that one must not trust someone else's time and instead experiment on his/her own setup. Everytime I moved, I had to recalibrate the method. However, for me the struggle is over: about two years ago a stumbled upon an egg cooker, a simple electric gadget that controls the timing by how long it takes a calibrated amount of water to evaporate completely. It's very easy and with perfectly consistent results. Alternately, I remember reading in a cookbook about the fact that temperature at which the yolk hardens is about 5-6*C higher than of the white (which is 70*C?). Therefore, one can get perfect soft-boiled eggs by controlling the water temperature at a point between the two and keeping the egg at that temperature long enough for the white to harden. this site will show you a few good ways to boil (or in some cases like the perfect egg, not boil) them. I think this is the method the previous poster was speaking of; cooking them for a long time between 65c-70c. I love San Sebastian. It's a great great city, especially the fireworks in summer. I would love to go back and try all the famous restaurants there. Now, maybe a stupid question: do you remove the plastic out of the cup or do you leave it in? I guess you take it out, but I'm not entirely sure from your description. Michael, I have always heard that shocking the eggs to make them peel easier is a complete myth, and that the only thing that matters here is how young/old the eggs are. Any thoughts on this? Do you have scientific proof on the shocking-theory? Michael, I tried this recipe (referring to immersing a pierced egg into boiling water. covereing & removing fm. heat, then allowing to simmer for 7 mins. f/b 1 min. ice water bath). The only thing I do different is eat from topped shell rather than peeling with - IMPORTANT - a horn egg spoon which doesn't interact with the egg. PERRRRRFECT! Thank you! I think the altitude at which you are doing the cooking makes a big difference in how long you have to cook the egg. Now that we live at about 3800 feet above sea level, I have to cook soft-boiled eggs for 7 minutes. I have eaten soft boiled eggs all my life but just recently discovered poached eggs! It is so much easier to poach the eggs, you can see them cooking and can therefore control the process, and it takes less than half the time and effort. In a nutshell; crack your egg into a small dish and set aside while the water heats up. Boil about 1.5" water (or enough to cover the egg) and a tablespoon of white vinegar in a small fry pan, turn heat down to a simmer or very gentil boil and add one, two or three eggs. Watch the eggs simmer skimming the foam that may develop. When the white of the egg looks and acts cooked - about three or four minutes - remmove it with a slotted spoon to a paper towel to drain for about 10 seconds. The egg whites can be trimmed up at this point to get rid of unattractive edges. Then transfer your poached egg to your perferred dish and enjoy. Other than that, these were the first soft boiled eggs I've ever made and were they good! The last post "is the ticket". I'm 78, have been cooking since I could reach the top of the stove, and have won prizes for my "amateur" cooking. In cookiing eggs (any style), it's all in the timing. Eggs react very quickly to heat or cold. For soft boiled, fill the bottom half of a glass double-boiler 3/4 with cold/cool tap water. If cooking with electric, place a metal wire grid over the coil with pot on top, bring to a rolling boil over a medium-high heat (high heat may crack the glass, and also is too hot for the actual cooking.) If cooking with gas, pot can be placed directly over flame, but also at a medium-high heat. When water is rolling, gently lower eggs, one at a time, with large spoon or ladle, into water. (We recommend cooking no more than four eggs at a time.) Set timer for 3 minutes and as soon as the bell sounds, place pot in sink and run cold water into hot water in pot at full force. As soon as pot is filled to brim, gently overturn into collender. large end of the egg. You can salt and pepper through this opening so that it's ready to eat. If you can't find this inexpensive tool at a local kitchen supplier, try sterilizing small-bladed manicure scissors in boiling water, place egg in egg-cup or dessert saucer-type dish, gently puncture small end of egg about 1/2" below top with scissors and slowly cut the top 1/2" from the rest of the egg. A small spoon, such as a demi-tasse, can be used to empty the egg into the saucer and it then can be eaten "as is" or spooned over buttered toast for a delicious breakfast. I find it much easier to eat or serve directly from the reminant portion of the shell (which also keeps the egg warm), rather than try to remove the shell from the egg and keep the white intact enough not to loose the yellow. Also, complete peeling takes longer and the egg cools too rapidly for tasty eating. My favourite way to prepare an egg takes only a minute. Lightly spray a small dessert bowl with your favourite non-stick spray. Break the egg into the bowl. Prick the yolk with a toothpick. Nuke in microwave oven at full power for 15 seconds. Wait 15 seconds. Nuke for another 15 seconds. If you like the yolk firm, wait another 15 seconds and nuke for 15 seconds more. Serve immediately on a slice of hot buttered toast. Sprinkle with salt and ground pepper to taste. Basically you need to know the temperature and diameter of your egg, then you can calculate the perfect cooking time in boiling water. He made a template which gives you the needed time for each diameter, but sadly its not available online. >so where are the formulae for amount of water required per egg. >surface area of the part being heated - of the container. >temperature needed to achieve and sustain for soft boiled eggs. >wider versus narrower but taller containers - which is more efficient. >different heating sources > wood fire > coal fire > gas hob > electric hob >amount of gas / electricity used - which is better or worse and why. >how many times have you reproduced the results successfully ? It cracks me up how people post comments without reading anything. The poster at the top that said if she cooks for more than four minutes the yolk gets hard didn't read the recipe. He said take them of the heat immediately and let them sit in the water for 7 minutes. DUH! Here is how I make soft boiled eggs, coming from a place where soft boiled eggs are a breakfast staple. Works for me every time, without any problems of cracked eggs either. Learned this from my polish mom! I use large eggs right out of the fridge and get a pan of water boiling just enough to cover the egg. I then take a push pin and make a hole in one end and then when boiling place the egg gently in the water. I cook if for exactly 6 minutes and then take it out and a quick rinse in cold water so I can touch it and then peel and eat! I've been doing it this way for over 30 years and always have perfect soft boiled eggs with cooked whites and runny yellow. I put them on toast or an english muffin! The trick of making a very small hole with a pin (in the end) lets the gas escape - especially the sulphur. In the case of hardboiled eggs, this also keeps them from getting that green/blue color on the white. >>lets the gas escape - especially the sulphur. good idea, but all wrong. putting a hole in the _large_ end of the egg allows the pocket of gas that accumulates there as an egg ages to expand without causing - or furthering pre-existing - cracking of the shell. eggs contain sulfur. eggs contain iron. it is the mixture of those two elements at the white/yolk interface that produces the greenish ring when overcooked or kept hot too long or kept cold really too long. (a) it has to migrate out of the egg "innards"
(b) penetrate the membrane and collect in the pocket. there's a whole bunch of folk lore about how to prevent the green rings. add salt, add vinegar, start hot, start cold, don't start, on and on. bottom line - too much temp for too long a time and you get a ring. it's a chemistry thing. Tried your way twice and both times, my egg whites are still very loose. Can hardly even get shell off without taking some semi-solid egg white with it. Your pot must retain a lot more heat than mine do. I'm going to stick with the old cold water, bring to a boil routine. I steam my eggs for 7 minutes. The results are the same. Why heat all that water? The same applies to corn on the cob. Just add enough water to the pot to get through the cooking time which is 4 minutes for corn. You will save alot of energy. Also, you can turn off the heat with a minute remaining if you use an electric burner. Between 3000 and 4000 feet water boils at ~205 degrees vs 212 degree at sea level. That will make a difference in cooking time. One can add salt to the water to raise the boiling point. Here's how I make soft-boiled eggs every morning. I am too busy to give it too much thought or effort. Put two refrigerated eggs in an empty saucepan. 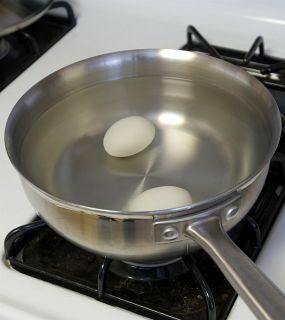 Fill the saucepan with water until it covers the eggs. When the timer dings I transfer the eggs to a bowl of ice water and set the bowl in the refrigerator for about 30 minutes while I finish getting ready for work. I pull them out of the fridge on my way out the door and enjoy them with fruit and coffee at my desk. And that, my friends, is how a workin' woman does it. P.S. - I like the idea of boiling the water, then removing it from the heat, and placing the eggs in. Then it doesn't matter what kind of cooktop you have. I'll have to try that method sometime. I love the STEAMING idea someone posted and will try that later this week. A few others debate the amount of water needed to boil and I agree that a little less than fully covered will work, adding a suggestion to stir them so all sides cook, but I DISAGREE with the person who wrote something about older eggs being better to use because they float allowing them to avoid hitting the bottom - when this way actually causes them to hit each other or the sides from the boiling bubbles. The simple solution is to not let the heat get as hot as I usually do I suppose but I guess this problem is only for hard cooked or if you like to set and forget like me sometimes. As gigelus2k3 notes the optimum time window to have a hard-boiled white and runny yoke is very narrow. In experimenting around the world, indoors and outdoors, over many years I was trying to put a list of the variables together so that I could deduce a basic equation for determining the timings rather than have to experiment for a few weeks every time I move to a new location. (I have boiled eggs in various climates, altitudes, terrains (apartments to deserts, camps to hotel suites etc. and timings can vary from 4 minutes to 6 minutes 20 seconds). With a colleague, recently in a desert location, altitude 2,100m, ambient temperature 42degC, it took a number of iterations to get this right and, in winter, temperature -2degC it changed (unfortunately we were not recording the atmospheric pressure (silly, I know but the meteo data gatherer was not installed!). Any further variables or ones that you consider redundant? I love the STEAMING idea someone posted and will try that later this week. . . .
SUPPERMAN, I also steam my "hard-boiled" eggs and now really like them that way (didn't like the "rubbery" texture of the whites when boiling them in water--tried various ways). I think I use 6 min rather than 7 as mentioned, but the size of the egg and coldness matters too; they're all good. [color=darkblue:4148796f58]. . Wanted to add though that steaming eggs creates whites that are much less rubbery and firm than boiling . . . They're quite "tender," in fact. I've eaten lots more "hard-boiled" eggs since discovering that... never been a fan of tasteless/rubbery eggwhites. Chopping just one steamed egg (I cheat with two cutting orientations in an egg slicer) then mixing in some mayo and a bit of salt makes a really delicious and quick egg salad sandwich on toast. don't know for fact, but I suspect that the coefficient of thermal conductivity for the white and the yoke may change as they solidify . . .
the rate is how many BTU/area will flow over time. so the surface area of the egg determines how many absolute BTU enter the insides over time. presuming the 'whole egg' is at the same temperature, one could calculate how many BTU is needed to raise the temperature of the mass of the white and the mass of the yolk to the desired temperature, and how many BTU 'get wasted' heating up the shell and the membrane via the the (four) coefficients of thermal capacitance - which determines how many BTU/mass is required to raise the temperature per degree. if the egg is left out on the counter for some time, it's no longer at a uniform temperature. makes things yet more complicated. then the calculations are straightforward. although altitude/atmospheric pressure does affect the boiling point of water - and its resulting steam - but it's probably easier to measure the temperature of the cooking medium vs atmospheric pressure when camping. measuring the temperature of the medium also negates the concern of salinity/mineral content of water - which does affect its boiling point. of course, not everyone likes their eggs done to the same degree. after the initial calculations, one has to loop back to the question of rubbery whites. (b) increase the temperature of the uncooked egg and recalculate the timing. pretty simple - most any teenager could probably write an app for that . . . . I followed these instructions *exactly* and I wasted four "large" eggs. This is FAR too short of a time to get soft boiled eggs. Furthermore, letting eggs sit in non-boiling water cooks them at an incredibly slow rate and most importantly, is a pointless exercise. If you want to waste eggs, use this method. If you want regular soft boiled eggs follow the directions on any number of millions of google results. Been working on this for a few days now. Altitude, altitude, altitude!!!!!! You have to figure out your cooking time at your altitude AND in your water!!!!! At 6207 ft above sea level AND in my water 12 minutes seems to be my magic time after I set the "from ref eggs" into the boiling water and then remove from heat and cover. Thank you for the article!!!! !